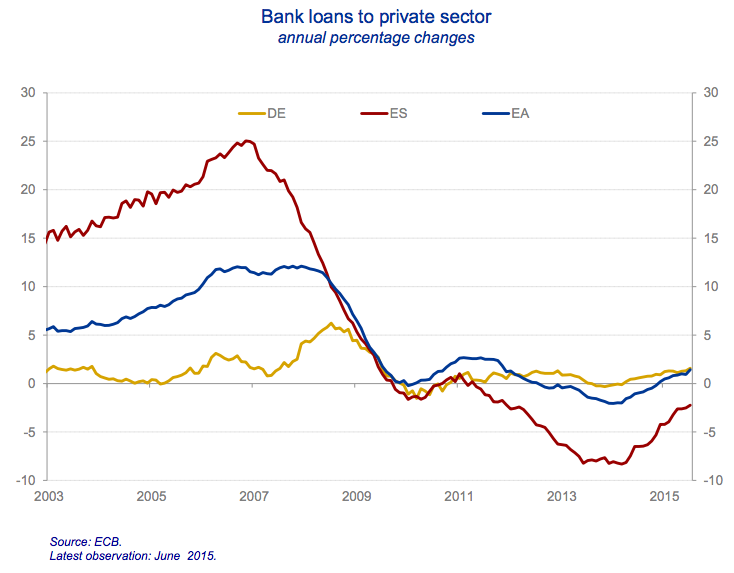 I think it is quite clear that without a growth in bank loans the amounts of deposits in the euro zone banks will not increase, at least not be way of bank lending. The other significant channels of deposit creation are (net) government spending and (net) exports. Quantitative easing is not one of these channels because it is not “working” empirically. Deposits are created, but they are not spend to a significant extent. There is another graph on real domestic demand which compares the US (rising) with the euro zone (flat). Anyway, what we have then is a situation in which the ECB understand macroeconomics but the German government doesn’t. There is still no recognition of the fact that to decrease unemployment (and increase economic growth) you need to come up with policies that increase the amount of deposits in the private sector. This is a dangerous situation for Europe and can possibly lead to a break-up once the not so small countries like France and Italy decide for themselves that they’ve had enough. On a side note, people in financial markets, in central banks and policy makers outside Germany now speak the same language as heterodox economists and enlightened mainstream economists. That is an interesting development!